60 families expelled from Gush Katif in 2005 found a new community in the Lachish region. 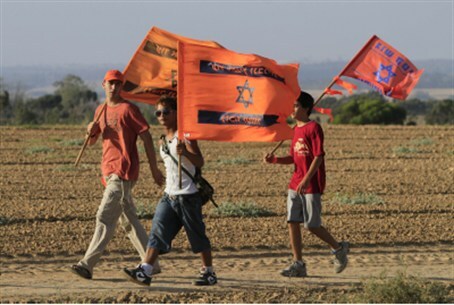 Sixty families evicted in the Katif Bloc (Gush Katif) Expulsion in 2005 have officially founded a new community in the Lachish region of southern Israel. The new community will be named Karmei Katif ("The Vineyards of Katif") and will initially be composed of 34 families evicted from the community of Katif and another 26 families from other communities in the Katif Bloc. It will be located near the moshav (agricultural community) of Amatzia. Tractors are already leveling out the ground on the site and construction of public housing will begin in short order. The community's founding was made possible by the siging of an agreement between the state and moshav Amatzia. The agreement was to be signed 18 months ago but various demands by Amatzia slowed down the process – until it was finalized this week. The plot that will serve the new community will be returned to the Israel Lands Authority, in return for other land that will go to Amatzia, and coverage of the moshav's debts. After development work is completed, a tender for distributing the plots among the eleigible families will be held. The families have been living in a temporary site on Amatzia's outskirts since the Expulsion. The chairman of the Tnufa Authority that assists Gush Katif expellees, Dr. Rabbi Ophir Cohen, said in response to the agreement: "I am glad that another community from Gush Katif gets to rebuild their home and return to the positive, productive and blessed circle of life that they were part of in the past." More than 8000 Israelis were expelled by Prime Minister Ariel Sharon's government in 2005 in the disastrous "disengagement from Gaza' and their homes, public buildings and businesses destroyed. Even the dead were exhumed and reburied outside the bloc. Hamas terrorists soon took over Gaza and have since been waging an escalated missile war against Israel.